Civil Rights Pioneer and Congressman John Lewis poses with SU Ag Center 4-H Youth Ambassador Jon'Terrinee Lewis at the Hartsfield-Jackson International Airport in Atlanta, GA.
Kevelyn Brown, standing on left, and Jon'Terrinee Lewis participate in an 'energy break' during the Walmart 4-H Youth Voice: Youth Choice Training. Jon'Terrinee Lewis, standing on left, and Kevelyn Brown demonstrate exercises taught during the Move-O-Matic Training during the 4-H Youth Voice: Youth Choice Training held at the National 4-H Youth Conference Center in Chevy Chase, MD. 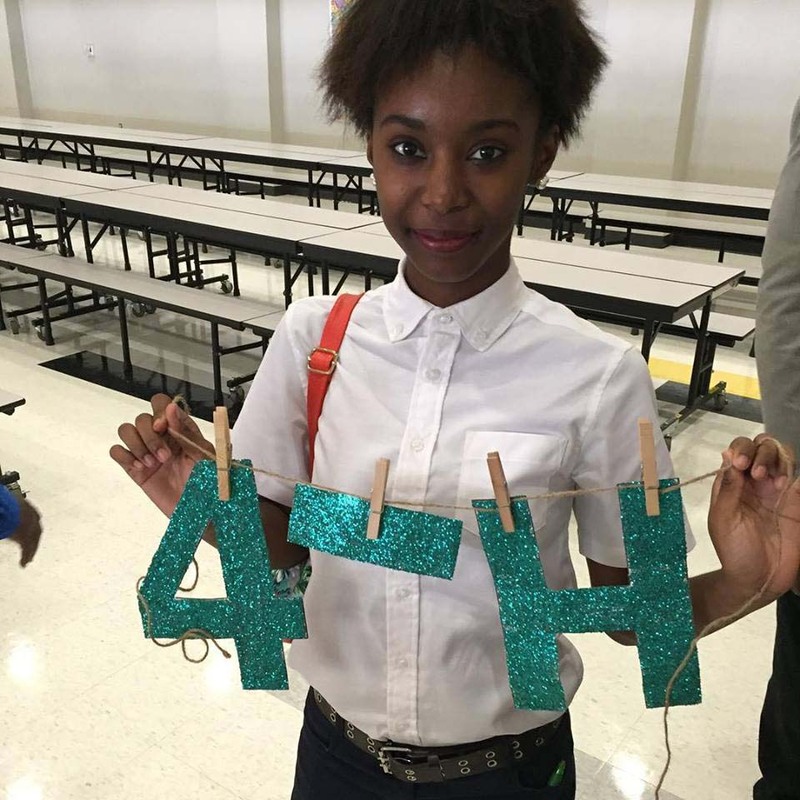 Baton Rouge, La - 4-H’ers Kevelyn Brown of St. Helena Parish and Jon’Terrinee Lewis of Opelousas, LA were chosen by the Southern University Agricultural Research & Extension Center (SUAREC) as healthy living youth ambassadors. In this new role, Brown and Lewis will help to guide their peers and communities into living healthier lifestyles through nutrition, and physical fitness. Brown and Lewis were chosen from hundreds of youth that Cooperative Extension Agents Goldie Jordan and Nicolette Gordon had previously worked with during the 2014-2015 school year. They were ultimately chosen based on their commitment and dedication to leadership, and willingness to make moderate changes to their daily eating habits. In transit to the Nation’s Capital, both Brown and Lewis had the pleasure of meeting Civil Rights Pioneer and Congressman John Lewis. He encouraged them to continue to travel and make their mark in this world. While attending the training, youth were able to tour the World War II Memorial, Vietnam Veterans Memorial, Lincoln Memorial, Washington Monument, and the Martin Luther King, Jr. Memorial. Youth enjoyed commentary and history about these memorials and had 20-30 minutes to explore each site on their own. Article written by Nicolette Gordon, Assistant Area Agent for St. Helena and Tangipahoa Parishes. Baton Rouge, La - Southern University Ag Center Interim Chancellor Dr. Adell Brown was featured on the television program ‘This Week in Louisiana Agriculture,’ (TWILA). The show aired on Cox channel 4 at 9 a.m. on Saturday, August 29 and on Sunday, August 30, 2015. Click the following link to view the video at https://youtu.be/FS90x8lbLBw. 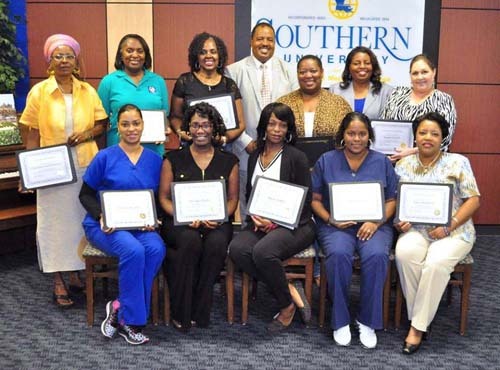 Baton Rouge, LA - Fourteen employees were recently recognized for completion of a Southern University System certificate program. Over a six-month period, the employees completed courses in Critical Thinking, Excel, Professional Writing, Business Writing, Punctuation, Grammar, Self-Motivation, Applying Critical Thinking and Time Management. 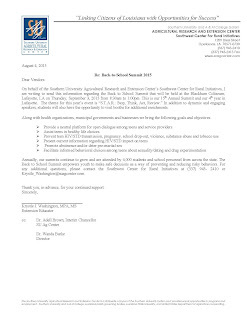 Participants included employees from Southern University – Baton Rouge, Southern University Law Center, and Southern University Agricultural Research and Extension Center. Among the program participants, six were from the SU Ag Center: Kim Butler, Decobea Butler, Alice Dyson, Joyce Peralta, Althea Thomas, and Joyce Tubbs. A recognition program was held to celebrate their accomplishments. “Professional development and lifelong learning helps to keep us sharp” says Andrea Benjamin, System Director of Training & Development, who can be reached at 225.771.5789. Baton Rouge, LA – The Southwest Center for Rural Initiatives (SCRI), a satellite campus of the Southern University Agricultural Research & Extension Center housed in Opelousas, has received a grant from the Walmart Foundation to teach healthy living practices to youth through its Ambassadors for Healthy Living Program. Louisiana is one of 21 states approved for funding by Walmart’s 4-H Youth Voice: Youth Choice Program. This year, the foundation donated $2 Million nationally to the program to expand its reach from 15 states to 21, reaching 75,000 at-risk youth and their families with interactive education about nutrition and food security challenges. The SCRI will provide youth with an understanding and knowledge of the phrase, “healthy living," impart a complete understanding of the importance of healthy living, learn strategies to develop and maintain a healthy eating and physical lifestyle, and become ambassadors of healthy living to encourage family and friends to develop and maintain a healthy eating and physical lifestyle through its Ambassadors for Healthy Living Program. The program will cover the SCRI’s ten parish area of St. Landry, Lafayette, Vermilion, Acadia, St. Martin, Pointe Coupee, Avoyelles, Beauregard, Allen and Evangeline Parishes, as well as, East Baton Rouge and Orleans Parish. “Health and happiness are interchangeable. When you are your healthiest, you are happier in every sense of the word. It is extremely important for all of us to be healthy, no matter what age! SCRI has already begun reaching out and improving the health of youth and families in the community. With this generous grant, we will be able to reach even more young people so that they can have a healthier lifestyle,” said Youth Specialist/Director of SCRI, Dr. Wanda Burke. According to the Child Trends Data Bank, child-aged food insecurity is associated with a greater risk for being overweight. Food insecurity can result in lower diet quality and less variety, both of which can contribute to being overweight and nutritionally deprived. Evaluation results from the 2011-2012 Youth Voice: Youth Choice program years show that participating young people reported a higher understanding of nutrition and physical activity knowledge and an increased active use of that knowledge. Additionally, participants’ attitudes towards nutrition and physical activity became more positive and young people showed an improved ability to make healthy food choices, even in food insecure settings. Other states receiving the grant including: Alabama, Arkansas, Connecticut, Delaware, Georgia, Illinois, Kentucky, Maine, Maryland, Mississippi, New Jersey, New York, Oklahoma, Puerto Rico, South Carolina, Tennessee, Texas, Virgin Islands, Virginia and West Virginia. 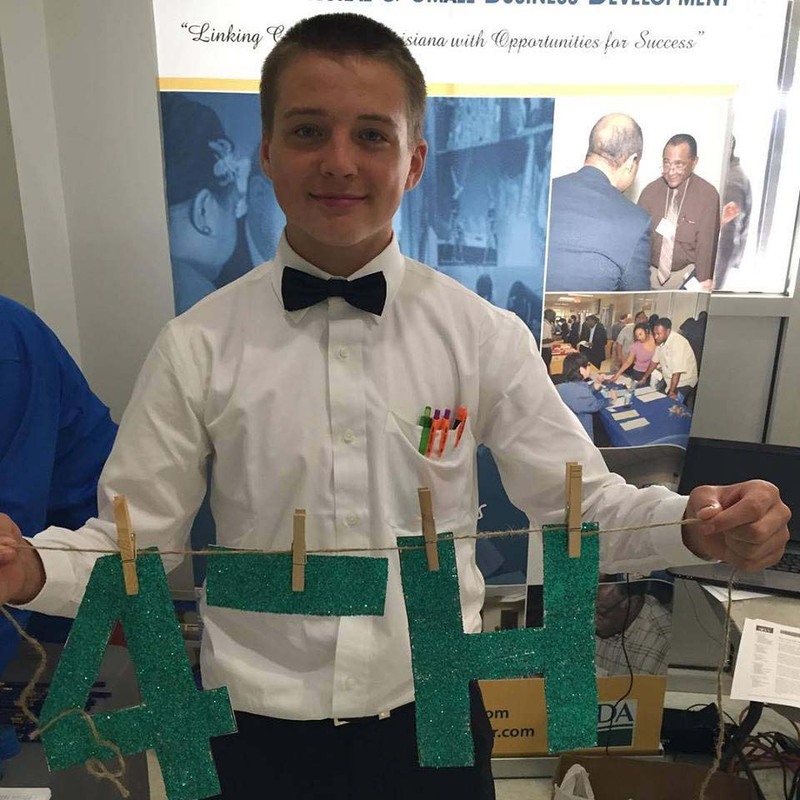 4-H is a community of six million young people across America learning leadership, citizenship, and life skills. National 4-H Council is the private sector, non-profit partner of 4-H National Headquarters located at the National Institute for Food and Agriculture (NIFA) within the USDA. Walmart and the Walmart Foundation are committed to helping people live better through philanthropic efforts. By operating globally and giving back locally, Walmart is uniquely positioned to address the needs of the communities it serves and make a significant social impact within its core areas of giving: Hunger Relief and Nutrition, Sustainability, Career Opportunity and Women’s Economic Empowerment. 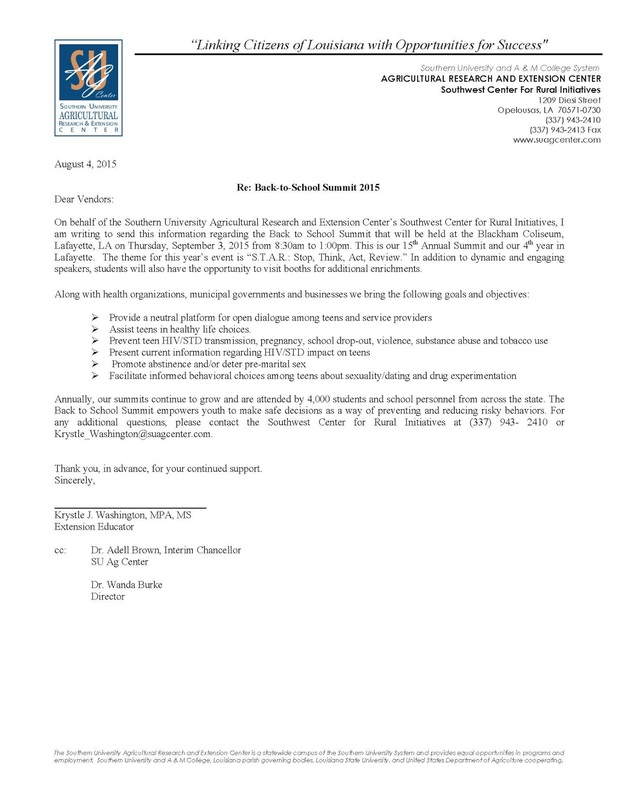 For additional information about the Ambassadors for Healthy Living Program or other programs offered through the Southwest Center for Rural Initiatives, contact Wanda Burke at 337-943-2410 or email her at wanda_burke@suagcenter.com. Goldie C. Jordan, Technology/Youth Development Specialist can also be reached at 337-943-2410 or via email at goldie_jordan@suagccenter.com. 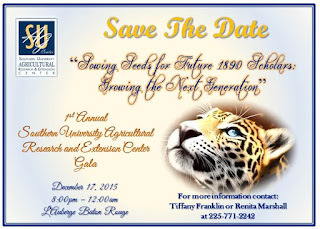 Baton Rouge, LA- Tickets are now available for the Southern University Agricultural Research & Extension Center’s 1st Annual Scholarship Gala themed, “Sowing Seeds for Future 1890 Scholars: Growing the Next Generation.” The gala will be held at L’Auberge Baton Rouge on December 17 beginning at 8 p.m.
All proceeds collected will be used to provide youth with agriculture-related experiences and scholarship support for incoming freshman. Individual ticket purchases are $50; tables, which seat eight, can be purchased for $400. The price includes dinner and live entertainment. The gala will also serve as the closing event for the Center’s year-long national celebration of the 125th anniversary of the signing of the Second Morrill Act, which created the 1890 land-grant system. For additional information or to purchase tickets, contact Renita Marshall or Tiffany Franklin at 225.771.2242. Baton Rouge, La - On August 25th and 27th, the Rural Utilities Service (RUS) will host webinars focused on the Rural Broadband Access Loan and Loan Guarantee Program (Broadband Program), which provides financing to telecommunications providers in rural areas where traditional financing is not otherwise available for the construction, improvement, and acquisition of facilities and equipment to provide broadband service to eligible rural communities. These webinars will inform participants about the major eligibility and regulatory requirements of the program and will provide detailed guidance on how to submit a successful loan application. There will also be time for participants to ask the speakers specific questions about putting together an application. Due to the limited amount of room available for each session, interested parties should pre-register with the RUS Policy and Outreach Division. Seats for each session will be reserved in the order in which requests are received by the RUS. Contact us soon to ensure you can attend the workshop that works best for your schedule. If you do require a telephone connection for either webinar (Instead of the standard VoIP connection), please contact Nicole Payne at Nicole.Payne@wdc.usda.gov. Baton Rouge, La - The members of the SU Ag Center Chancellor’s Executive Council attended its 2015 retreat on Friday, August 14. 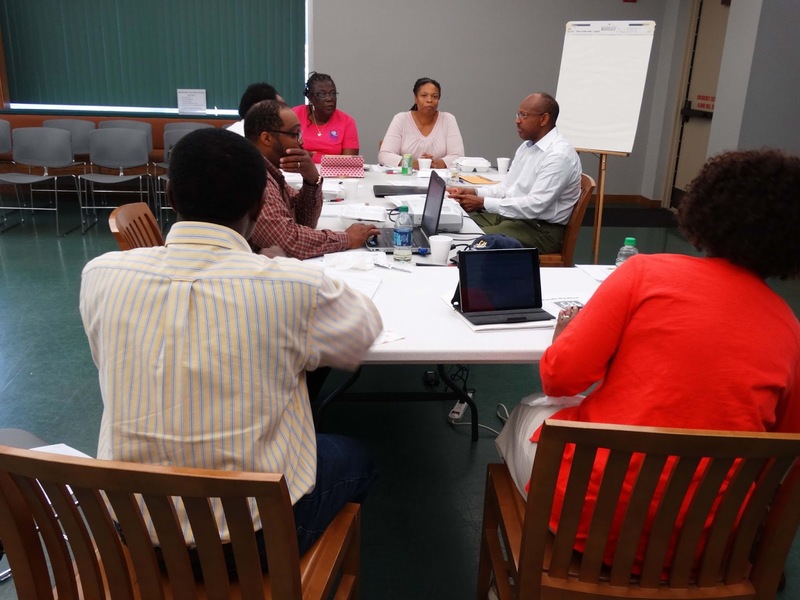 The retreat which was held in the Scotlandville Library was designed for the council members to revisit the strategic plans for the SU Ag Center, review the 2014/2015 budget (and projections for 2015/2016), examine the organizational chart, offer research & extension vision on future directions, provide vision on statewide coverage of extension programs and evaluate accountability, policies and procedures. In his opening remarks, Dr. Adell Brown, interim chancellor, reminded participants that “real leadership speaks to higher values … and can make a difference in people’s lives”. He also asked the executive council members to suggest ways to ensure cost savings, motivate employees to do more, ensure effective and efficient utilization of resources and be able to help improve the quality of life and well-being of Louisiana citizens. The retreat which started at 9:00 AM concluded at 4:00 PM. Participants at the retreat were: Adell Brown, Jr., interim chancellor, Gina Elaine Eubanks, vice chancellor for extension, Willie Rawls, associate research director, Linda Batiste, director of finance, Christopher J. Rogers, director of technology, Oscar Udoh, coordinator for planning & evaluation and Wanda Burke, director, Southwest Center for Rural Initiatives. Please email bob.ellison@oc.usda.gov if you have problems or suggestions. Baton Rouge, La – The Southern University Ag Center took the Building Opportunities through Leadership Development (BOLD) to n St. Helena Parish. A back-to-school informational session was held at the St. Helena Career & College Academy in Greensburg, LA on August 7. The Youth Organizing Leadership Opportunities (YOLO) is an entity of the BOLD project. The YOLO group works with youth in the area of leadership. The event was facilitated by Dana Isaac, Extension Assistant, who collaborated with colleagues. 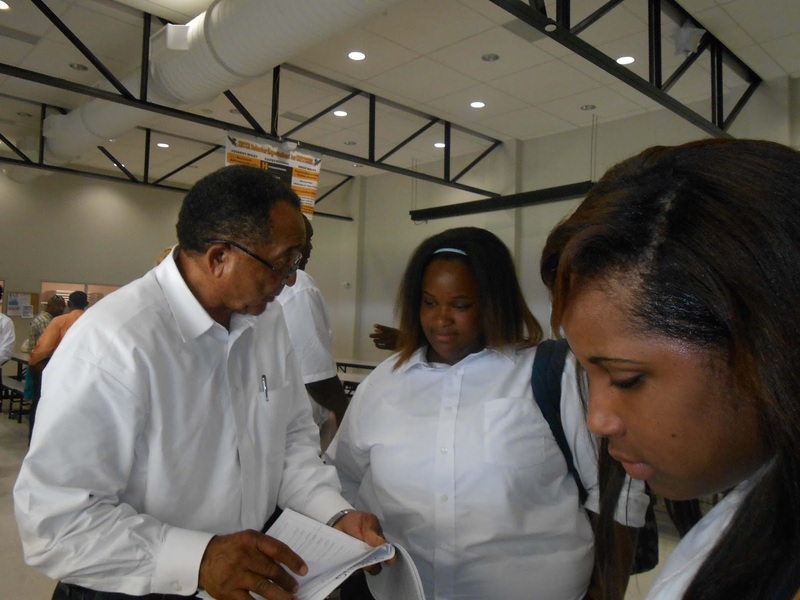 Eual Hall, Business Development Specialist from the Center for Small Business and Rural Development presented information on youth entrepreneurship and the steps to start a small business. He also showed the video of the importance of an 1890 university. Frankie Poland, Regional Coordinator for the Communities of Color Network, shared information on the dangers of tobacco, second-hand smoke and the harmful poisons found in tobacco products. Ahmad Robertson, Area Agent, St. Helena and Tangipahoa Parishes presented information on agricultural topics such as maintaining a farm, caring for livestock, and gardening. Nicolette Gordon, Assistant Area Agent, St. Helena and Tangipahoa Parishes had displays and information booth for all the clubs she has established for the youth in her parishes. The clubs are 4-H, Outstanding Mature Girlz, and Jaguar Leadership Club. About 40 youth signed up to join the various clubs. Isaac gave out various tips and printouts on how to manage stress, and make smart and good decisions as teenagers. She also gave a few of the teachers some information on what causes stress in youth and factsheets on how to help teens make good decisions. The Career & College Academy principal, Reginald Douglas, the assistant principal, Jennifer Grace, along with the Superintendent of St. Helena Parish School Systems, Kelli Joseph, PhD were pleased with the presentations made to the students. They stated that the SU Ag center employees are always welcomed at their school. 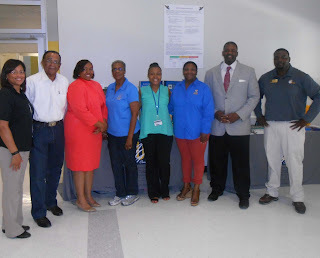 Baton Rouge, La – The Southern University Ag Center kicked off “Club Recruitment Day” on August 7, 2015 at St. Helena College & Career Academy in Greensburg, Louisiana. At the event, Southern University Youth Development Agent Nicolette Gordon said, “There are two awesome clubs that we have implemented at St. Helena College & Career Academy, and we can’t wait to get the third club underway!” The three clubs are iLead (Interactive Leaders Engaging & Advancing Democracy), OMG (Outstanding Mature Girlz), and Jag Leaders that will also serve as Ambassadors for Healthy Living in the Greensburg community. Students stopped by the SU Ag Center’s information table during their lunch shifts and registered. Gordon also stated that she is working with Schoolboard Members and Police Jurors to get the Youth Educational Support (Y.E.S.) After School Program underway. The YES Program is scheduled to kick-off in September at the Multi-Purpose Center in St. Helena’s Fifth District. 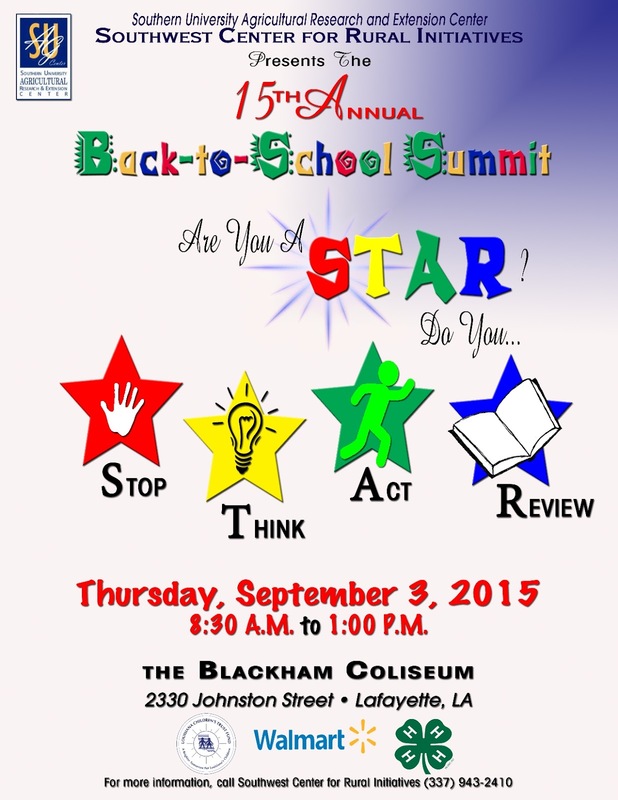 Baton Rouge, LA - The Southern University Agricultural Research and Extension Center, through its Southwest Center for Rural Initiatives, will host its 15th Annual Back-to-School Summit on Thursday, September 3, 2015 from 8:30 a.m. - 1:00 p.m. at the Blackham Coliseum, Lafayette, LA. The theme for this year’s event is “S.T.A.R. 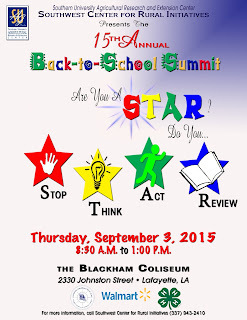 : Stop, Think, Act, Review.” In addition to dynamic and engaging speakers, students will also have the opportunity to visit booths for additional enrichments. The summit is free and open to all 8th graders in Acadia, Allen, Avoyelles, Beauregard, Evangeline, Lafayette, Pointe Coupee, St. Landry, St. Martin, and Vermilion Parishes. This 10-parish wide event is a collaborative effort between the SU Ag Center’s Southwest Center for Rural Initiatives and several non-profit organizations, state agencies, local municipal governments, and businesses. Vendor registration invitation letter is attached. For further details, contact the Southwest Center for Rural Initiatives at (337) 943-2410 or email Krystle_Washington@suagcenter.com. Baton Rouge, La - U.S. Department of Agriculture Secretary Tom Vilsack announced the start of the 16th annual Farmers' Market Week, which began Sunday, August 2, and runs through August 8. Vilsack made the announcement as Agricultural Marketing Service Administrator Anne L. Alonzo and local officials launched the annual observance of National Farmers Market Week at the Santa Fe Farmers Market. New Mexico Department of Agriculture Secretary Jeff M. Witte, Santa Fe Mayor Javier M. Gonzales, and Santa Fe Farmers Market Director Paolo Speirn joined the celebration. "Farmers Markets benefit communities by offering healthy, wholesome food while local farmers and ranchers benefit from new ways to present their products to customers," said USDA Secretary Tom Vilsack in Washington, DC. "People are changing how they think about farmers markets as they become community gathering points, and we have seen a 64 percent increase in customer traffic in markets open for at least two years." AMS supports Farmers Markets through grants, research, and technical assistance. Last year, AMS awarded $26.6 million in competitive grants though the Farmers Market and Local Food Promotion Program, including more than $500,000 in grants awarded in New Mexico. AMS also manages the National Farmers Market Directory, one of four USDA Local Food Directories that provide customers with easy, one-stop access to locations, hours, and other information about farmers markets, community supported agriculture enterprises, food hubs, and on-farm markets. The Louisiana Department of Agriculture and Forestry again secured a grant from the USDA to participate in the 2015 Senior Farmers Market Nutrition Program (FMNP) allowing senior citizens to buy locally grown fresh fruits, vegetables, cut herbs and honey at farmers markets and roadside stands. This program helps to increase access and consumption of fresh fruits and vegetables by seniors, as well as supports local farming producers. Seniors who applied for the program this year have until November 30 to visit their local farmers market or roadside stand to utilize their vouchers. While the program is closed for this year, applications will be accepted again in March of 2016. The LDAF Commissioner Mike Strain encourages senior citizens 60 years and older who meet certain income requirements to contact their parish Council on Aging next year to participate. In New Orleans, seniors can contact Catholic Charities. A list of Louisiana Farmers Markets is available at the Louisiana Department of Agriculture and Forestry website.